UPDATE: OnePlus has now restocked some of the handset options after all but one configuration had run out of stock. Both the 128GB and 64GB handsets are now available in Slate Grey, as is the Midnight Black 128GB option. You can get them from oneplus.net/au. So if you're eager to see what the OnePlus fuss is about, you better hurry as stocks are limited and the special soft launch pricing and bonus case offer won't stick around. Chinese smartphone manufacturer OnePlus has announced that it will be ‘soft launching’ — essentially, doing a test run — its hotly-anticipated OnePlus 5 flagship handset in Australia on August 29. According to the company, this initial test launch will consist of ‘a limited-stock open sales event’, where customers can purchase a single handset from oneplus.net/au, as well as two fan meetups in Sydney and Melbourne. Details on what the latter meetups will consist of are still to be confirmed. The stock available from the oneplus.net/au store will be limited, and sales will cease when this runs out. If you’re super keen on picking up a handset, we’d therefore suggest getting in quick. According to OnePlus, the reasoning behind the limited event is to “test product and supply chains in Australia”, presumably ahead of any major launches the company may or may not be planning. 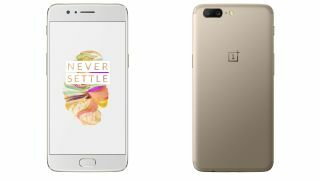 The OnePlus 5 with 6GB RAM + 64GB storage in Slate Gray and Soft Gold colors will be available for AU$599. The OnePlus 5 with 8GB RAM + 128GB storage in Midnight Black and Slate Gray colors will be available for AU$699. These prices seem quite reasonable, considering the lower and the higher tier models launched for US$479 and US$539 respectively in the US only two months ago — these prices almost directly reflect currency-conversion rates, which we don’t often see with tech pricing in Australia. Further to this, if you purchase either model during this soft launch phase, you will receive a free OnePlus 5 Sandstone protective case, although the company has been at pains to re-iterate that the above pricing and bonus offer only applies to the soft launch period. There’s one caveat to this soft launch — according to the press release from OnePlus, this first batch of handsets will unfortunately not come with an Australian charger, instead shipping with a UK Type G plug charger. Thankfully, the phones will work fine on all Australian mobile networks, however. If you’re fine to charge via USB or travel adapter and are after an excellent handset at a decent price, then get ready to visit oneplus.net/au on August 29. In the meantime, check out our in-depth OnePlus 5 review to see what all the fuss is about.